After a year and a half of searching and interviewing a number of pastors, the Reverend David P. Hudak, who served at Holy Trinity Lutheran Church in Streator, Illinois, accepted the call to serve as Administrative Pastor of St. Peter Lutheran Church. Pastor Hudak and his family moved to Schaumburg in January 1992. Pastor Hudak was installed on Sunday, February 2, 1992. A groundbreaking ceremony for a new sanctuary was held on May 1, 1994. The new building is located near Schaumburg Road. 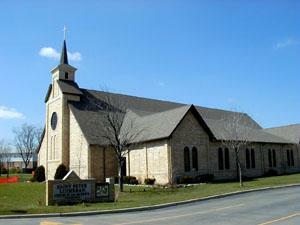 The dedication of this new sanctuary was held on June 25, 1997. Sue Burke served as Minister of Care from 1989 until her retirement, September 1, 2007. The Reverend Eldor W. Richter became part-time Pastoral Assistant on November 15, 1997. Curt Jungkuntz resigned his position as Minister of Youth to pursue a full-time teaching career. The congregation then called Mr. David Cheatham to serve as Minister of Youth/DCE. He was installed on September 10, 1999. Mr. Cheatham left the congregation in November 2002. DCE interns from Concordia University Chicago were employed to work on an interim basis in the areas of Children’s Ministry and Youth. A connecting building between the church and school was completed in the fall of 2000. The building houses five classrooms, a media center and a multi-purpose room. In December 2002, the Reverend Fred C. Ade was called home to be with the Lord. The congregation called the Reverend William C. Cate of Rockford, Illinois, to serve as Associate Pastor after he served a year of vicarage at St. Peter. Pastor Cate was installed on September 11, 2005. His wife, Paula, was a first grade teacher in our Christian Day School. Pastor Cate accepted a call to a church in California in 2009. Paula and Pastor bill Cate left in December of that year. Jaime (Lange) Brinkman served as intern in 2003 and was later called to service as DCE working with Youth Ministry. She left in 2006 to serve as a missionary in Panama. Sherry Hentze was called to serve as DCE for Children’s Ministry in 2004. Nathan Patterson served as DCE intern 2006-2007 and was called in 2007 to work with junior and senior high school youth. Jason Grandt became St. Peter’s first Technology Coordinator in 2004. Joan Falkenthal retired October 1, 2007, after serving as church executive administrator for 38 years. Worship attendance averages 700 each weekend. St. Peter employs more than 50 full and part time employees. 301 children attend St. Peter School. The church narthex was redecorated in 2007 with ceramic, slate style tile, wall covering and new furniture. Saint Peter Lutheran Church is affiliated with The Lutheran Church—Missouri Synod which shares the same year for its organization, 1847. Rev. Matthew C. Harrison is president of our church body with headquarters in The International Center, 1333 S. Kirkwood, St. Louis, Missouri 63122. Saint Peter Lutheran Church is in the Northern Illinois District with offices at 2301 S. Wolf Road, Hillside, Illinois, 60162. The district president is the Reverend Dan Gilbert.